This mountain town is surrounded by lofty peaks topped with a dusting of snow, verdant pine forests, and tranquil lakes, ensuring that you will have a stunning view in any direction. Many people head to Aspen every summer to enjoy the excellent hiking, fishing rafting, mountain biking and camping. In the winter, this town becomes a snowy paradise ideal for skiing and snowboarding. 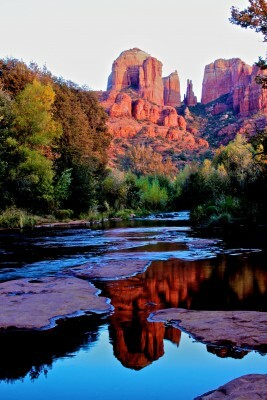 Whenever you see a stunning vista of red rock canyons in a Western, there is a good chance that the footage was filmed in beautiful Red Rock Country near Sedona, Arizona. There have been at least one hundred movies and TV shows set within this beautiful landscape where deep canyons, majestic buttes and dramatic rock formations personify the freedom of the Wild West. These colorful cliffs were once home to American Indians in ancient times and there are legends of their spiritual power. Once you have watch the sun slowly sinking in the sky above this raw and rugged landscape, you will understand why. This lush tropical valley is one of the most beautiful areas on Kauai, one of the islands of Hawaii. It is very remote, only accessible by kayak and it is almost entirely unspoiled by mankind. High green cliffs tower over water that is unbelievably blue and the cacophonous calls of exotic birds fill the air. This valley is very popular with hikers, campers and other outdoor lovers. On your next holiday, why not travel one of these American destinations and marvel at the natural beauty of this land?